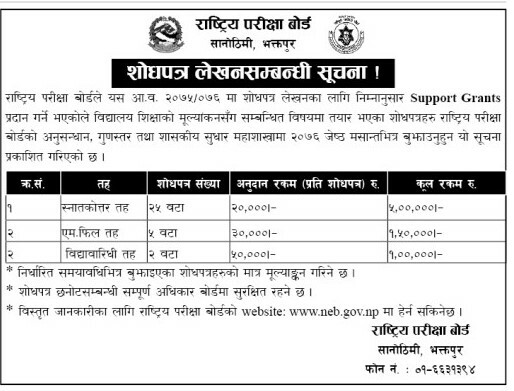 National Examinations Board (NEB), Nepal is providing support grants for Master, M. Phil and Ph D enrolled students in Universities of Nepal. The grants focus on supporting students who are interested in researches on topics related to the improvement and upgrading the school level examination system in Nepal. The study must be concerned with the topics related to the improvement and upgrading the school level examination system in Nepal. The researchers must be a Nepali citizen. They must have completed following semester in their specific program. 3rd semester for master degree. enrolled and registered for Ph. D.
Proposal must be submitted to the NEB with the digital and scanned copies of their certificates. If the previous degree has been completed from a foreign university, equivalence certificate must be submitted. Proposal (according to the NEB format). Thesis proposal beforehand should be finalized by their respective supervisors. A letter from corresponding department stating that the student has not received any other grants for this research. Progress report should be from the previous year (for Ph. D. Scholars). The selected candidates need to submit their progress reports every 6 months during the course of their grants for PhD. scholars.